As a soloist, Anouk performs on both the pedal harp and Celtic harp. 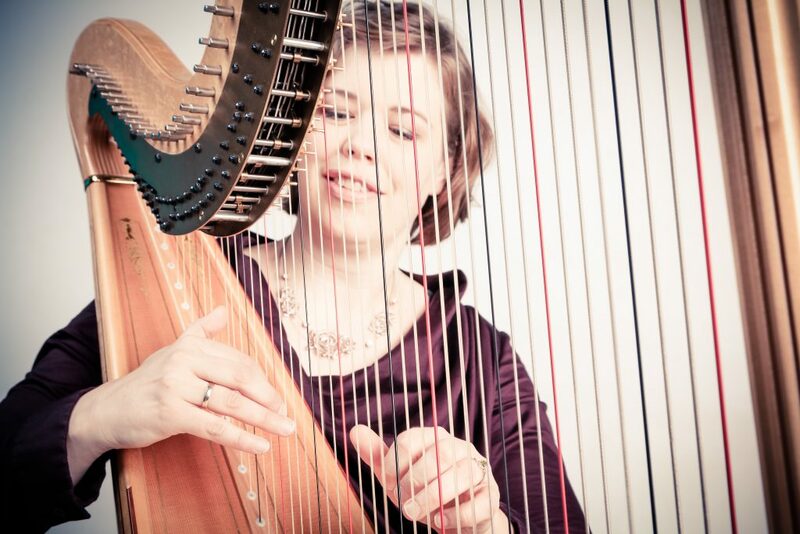 Anouk is passionate about promoting the Celtic harp and bringing it to a wider audience. Her repertoire encompasses a range of traditional European music, including music from the Netherlands. Dutch folk music is often forgotten or neglected, but Anouk seeks to revive this music for a modern audience. The pedal harp is well loved throughout the world. It has a fine repertoire from early music to jazz. Anouk likes to make the music come to life for her listeners, sharing not only the music but also the stories behind it. A recital is the perfect way to get to know the harp and its player better. Anouk likes to plan recitals to be set around a theme, with music and stories coming together for a lovely hour of entertainment. There are many possible themes, but one of Anouk’s favourites is a recital about the history of the harp. For this recital she brings both her pedal and her lever harp, to illustrate the difference between the two in use and in sound. The recital starts with early music from before the existence of the pedal harp, takes the listener to the birth of the pedal harp and the music played at the time all the way to modern times and living composers. An entertaining and enlightening concert for all ages. Of course once curiosity is peaked there are always some extra questions about the harp; the audience is welcomed to ask any questions they may have, giving the concert an interactive character. The harp is also a perfect instrument for a special feature in a concert, during a meeting, the opening of an exhibition or during a lecture. Anouk likes to pick her pieces especially for these occasions. She is frequently asked to play during concerts of music ensembles (a choir, for instance) and will then pick the music she plays in accordance with the other music of the program. Harp music works especially well for a meditative moment. During a memorial service the harp music can enhance the atmosphere and give participants a little time for reflection and contemplation. It can also enhance the meaning of poetry or stories, because the music is picked especially to fit the text. As a way of setting the atmosphere during a dinner or opening of an exhibition, Anouk can play background music in different styles. Live music will enhance the atmosphere, while the presence of the harp itself will add a touch of elegance to the overall look of your event. Weddings are a special occasion in which the music can be extra important. Live harp music can provide the special touch and help forming the connection between one of the happiest days of your life and the creation of those cherished memories that last a lifetime. During a wedding ceremony there is usually some time for music. The bride may enter the room to the sound of the harp as if it were a fairy-tale. During the signing of the papers, the harp will provide a festive touch for the on-looking guests. Anouk is able to fulfil special requests, for instance if the couple would like to hear their special song played. At the end of the ceremony lively music can accompany the couple and their guests to the next part of their day. Later on, the harp might be featured again, while cutting the wedding cake, during the reception or at the dinner. For questions, bookings or estimates, please contact Anouk here.